We have a small place (about 100 acres) in Colorado County, Texas, on the Colorado River north of the town of Weimar. We are gradually clearing (bulldozing) the woods of cedars. One particular spot is fairly steep, 4-5 acres. We need to plant, sow grass seeds. What would you recommend? It is now fairly exposed to the sun, the soil seems ok, is irregular in type, somewhat loamy (though I am no expert). I notice the highway department seems to use some kind of mat that must be embedded with seeds. I mention that only because it seems such material might help to prevent erosion while the plants begin to take root. We are trying to be as environmentally correct as possible, within financial limits. We have no irrigation system, just mother nature. Any thoughts? Thank you very much. Mr. Smarty Plants has answered a number of questions similar to yours from various parts of Texas. I have excerpted one of these that is appropriate for your needs. First, there are several prairie restoration organizations with a wealth of information to help you in your very worthwhile project. 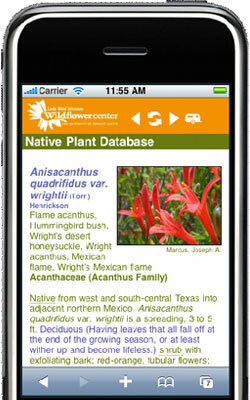 You might start by looking at the information from the Native Prairies Association of Texas. In particular, see Planting a Tallgrass Prairie: What to Plant. Native American Seed in Junction TX has a Prairie Starter Mix with most of the grasses named above as well as a few more. But for your area I recommend a mix of grasses and wildflowers such as Native American Seed's Coastal Prairie Mix. If you prefer to assemble your own mix, most of the seeds are available as individual species at Native American Seed or probably at some of your local plant nurseries. It is important to prepare the ground to remove the most noxious weeds and make certain that your seeds contact mineral soil, as described in some of the above-referenced instructions. If erosion seems likely, you might consider laying down either straw- or wood fiber mats, available at Native American Seeds, after sowing the seeds. You might also find several of our "How to Articles" useful, especially Recreating a Prairie. You might also like to visit Clymer's Meadow Preserve, the largest tract of tallgrass prairie in Texas located in Hunt County. There is more information about prairie restoration at Prairie Parcel Restoration from Teacher Research Associates (TRAC) Program at Fermi National Accelerator Laboratory in Batavia Illinois and at Prairie Restoration from Prairie Plains Resource Institute in Nebraska. Transplant shock in my Nuttall Oak tree in Moore, OK.
October 08, 2013 - I was told that there is an ordinance against planting cottonwood trees in Madison, WI. Is this true?